I have been preparing the gesso base for some raised gold and silver leaf on my latest artwork and have made such good progress today, I am very pleased with myself! That does not often happen as other things usually get in the way and I do not get done all that I wish to. I suppose that happens to many of us as we get older! Final preparations are in hand for the Iceni Botanical Artists Exhibition at the Apex, Bury St Edmunds; paintings and prints have been chosen for the Art4Africa event; and today I am working on “The Green Man’s Covert” for Southern Nature in Art which this year is including a special section entitled “Nature’s Myths and Legends”. I have known about this section since January and all the while at the back of my mind have been thinking about what I would like to portray. Last week the final composition popped into my head and I have been working flat out to design and draw it. I now have five days to complete it – its frame is being made as I write, so it will be a case of making sure I finish it and then pop it into its specially made frame. 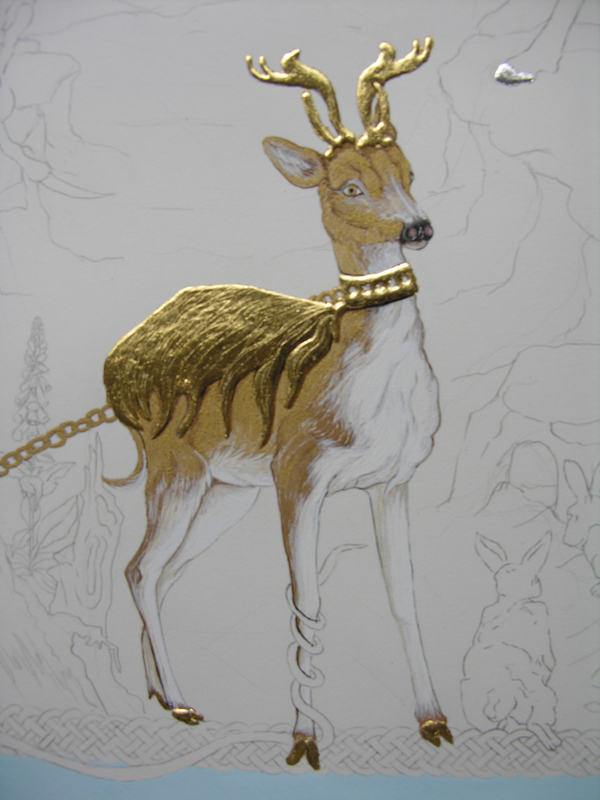 As this is a totally new work I shall not show it here in its infancy, but can show you part of it: the Golden Hind. The whole picture will be an illumination, so there is raised 24ct gold and silver leaf as well as 23ct shell gold – which is real gold mixed with water and gum arabic so that it can be painted finely onto the paper. I usually get in a real mess when reconstituting the gesso and applying the gold leaf, but everything went smoothly for a change. I just hope that I do not now loose control and muck up the painting! Here is the Golden Hind. If you wish to see the rest of the painting, it will be on my website after the Southern Nature in Art Exhibition (August Bank Holiday). Or of course you could always attend the exhibition and see it in person, if you are down in Hampshire at the time. I shall be there for all four days in the Art Market selling my wares and demonstrating – that is another decision: what to take to paint for the demo!